Evenings, weekends, holidays: you can’t help avoid taking a peek at your work inbox to deal with details and emergencies or leave your phone turned on in case someone needs you. At a time when more and more countries are putting laws in place that favour the right to disconnect, learn about the best reflexes to completely cut yourself off from the office when you are not on duty! This is the first step and undoubtedly the most difficult. One of the reasons that you might have difficulty disconnecting is that you are (or you consider yourself) indispensable to your business. It might come as a revelation, but unless there are very exceptional circumstances there is little risk of it collapsing because you don’t answer the phone for a few hours, or even a couple of days. Do some work on yourself, with some training on letting go or a psychologist if needed, to admit that your presence andresponsiveness are not as vital as that. message giving this person’s contact for anyone that has to have an answer. Return the favour, of course, if this colleague asks you next month to do the same, accept. Being constantly connected can be a real source of conflict within a couple or family, but well managed, these relationships can help you disconnect your devices and your brain. Ask your spouse or friends, for example, to intervene when they see you working when are supposed to be enjoying their presence. Set up clear rules: if you are on your work phone after a certain time, they are to force you to stop. And of course, don’t blame them! It’s you who asked them and it’s for your own good. chocolate or an episode of your favourite series when you manage to spend half a day without checking your emails, or force yourself to do a chore that you hate if you yield to temptation. You will eventually automatically associate disconnection with positive things and connection with negative. Turn off your phone and computer and don’t turn them back on until a preset time (why not on Monday morning while commuting to work). Ideally, leave them at the office, so even if you feel like it you won’t be able to use them at home. If you use the same devices for personal and professional use, deactivate all notifications related to your workand disconnect from tools such as your inbox, Skype or Dropbox to be unreachable. 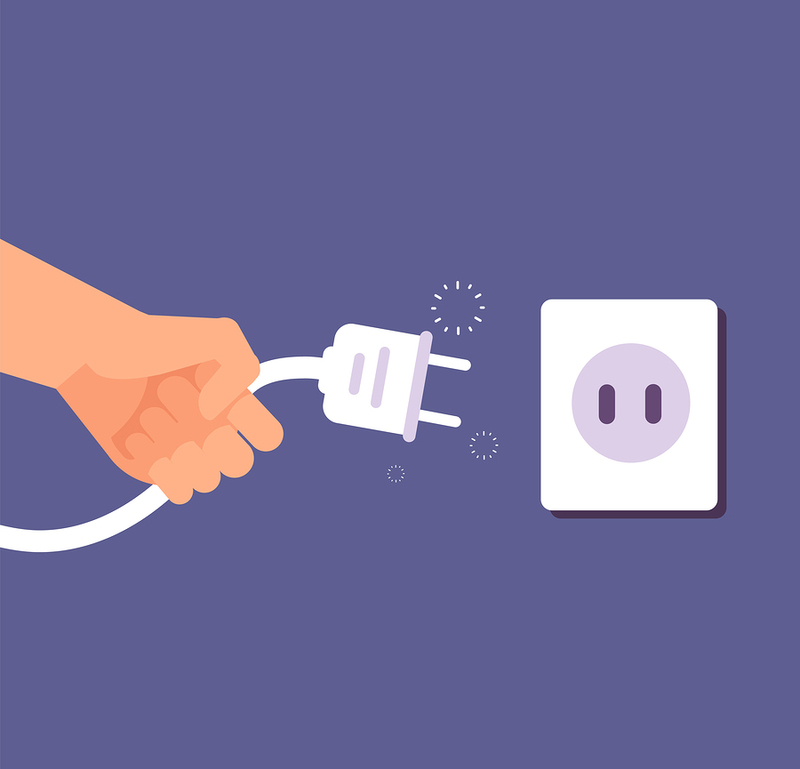 Ultimately, you are not solely responsible for your ability to unplug. Your company can and must set up a suitable policy to help you. First of all, no one should contact yououtside your work hours. Let them know and redefine the notion of urgency: how many times have you been disturbed during a family evening for something that could very well have waited until the next morning? Then, work with management to see what they can arrange. This way, the IT department may very well block access to your inbox after 7pm, so you cannot see it even if you are tempted!